Svetlin Nakov, co-founder of SoftUni, is part of the expert jury of the Bulgarian challenge within Elevator Lab – the largest corporate fintech accelerator in CEE. The program was created by RBI and aims to find the best start-up companies in the field of finance and to build long-term cooperation with them. 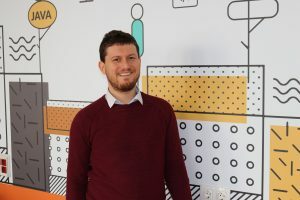 We talked with Svetlin Nakov about innovation, partnership between established and starting companies and benefits of participating in acceleration programs. Mr. Nakov, what do you think about cooperation between established companies and start-ups that create innovative products in different sectors? When you launch an innovative project, you always need support. At first, you have to take care of everything: create a product, build a team, find customers, develop marketing and sales, and build a system for implementation and maintenance… You want to do all of this in a very short time, but must do it without a solid budget or even with a zero budget. I have been in such a situation several times in my life and I know that big companies’ experience could be really valuable. Some of them may be more cumbersome and slower to innovate, but they are more stable and can provide solid financial basis, marketing support and management experience, promote the start-up’s solution to new markets, help starting entrepreneurs with key contacts, investors and partners. If a working formula for collaboration between start-ups and established companies could be found, it would result in serious benefits to both parties. What are the benefits for start-up companies from such a partnership? Established companies have a comparatively large customer base, they are specialized in their individual market segments, and can offer innovative products and services on clients and partners within their network. Reaching the market is one of the most difficult tasks for every starting company. Small start-ups need resources: financial, staff, management, even legal, accounting, etc. The best scenario in my view is when the start-up focuses on the core of its product or service, and the rest of the tasks are undertaken by experienced managers with already available infrastructures and processes. When you are a young entrepreneur, you often lack business experience. This is something that experienced managers and entrepreneurs can pass on to the younger ones under their mentoring. It is much better if someone with experience shows you how to do things. Why should young entrepreneurs participate in accelerator programs? When you make your first steps in real business, you have neither enough experience, nor enough capital, nor enough human and organizational capacity to build a truly good product or service and then successfully develop and sell it. Most entrepreneurs learn the business in the practice during their first initiatives – they fail, gain experience and try again. This cycle “try à error à try again” can be optimized through acceleration programs where you benefit from mentoring, resources, and business support. I think that for young and inexperienced entrepreneurs acceleration programs are a great opportunity and significantly increase the chances of success. What should the projects of Bulgarian start-up companies feature to compete on a global scene similar to Elevator Lab? In order to succeed in the financial and technological world, a start-up should offer an innovative product or service that solves a significant problem for businesses or consumers so that they would be happy to pay for it. I would rely on a strong concept with innovative elements, a strong product or service, proven market demand, tested in a real market environment prototype, and all that driven by a solid team. To find a working decision of significant problems, make people dream of having your concept and clients be ready to pay for it.